Humanity has reached out to the stars on the wings and rockets of incredible flying machines, culminating in a permanent space station orbiting above the Earth. But the journey from the skies to space includes many smaller steps that opened humans' eyes to knowing what is possible under the heavens. Each step represented a human flight of fancy transformed into a real flying machine — the Wright Brothers flyer, the supersonic Blackbird spy plane, and the huge Apollo rocket that carried men to the moon. Each machine, whether it resembled the fragile Wright flyer or the sleek SpaceShipOne, channeled human spirit and ingenuity through its mechanical shell to do amazing things. The First Airplane: Wright Flyer: Kites, gliders and a toy helicopter inspired the Wright Flyer's boxy design that became the first manned, powered, heavier-than-air and controlled flying machine. The brothers achieved their first historic 12-second flight at Kitty Hawk on Dec. 17, 1903, after hundreds of previous gliding tests and experiments with a homemade wind tunnel. The Red Baron & Aerial Weapons of World War I: Manfred von Richthofen, the World War I flying ace known as the Red Baron, viewed his German fighter aircraft as flying platforms for his guns rather than aerial stunt machines. But he and his fellow pilots on both sides pushed the limits of their biplanes and triplanes to shape their designs into graceful and speedy weapons of war. The Hindenburg was more than three times longer than a Boeing 747 jumbo jet. The Zeppelin Hindenburg: When Airships Ruled: The luxurious Hindenburg represented the queen of the skies as the largest aircraft ever built, before it met the fiery ending that reduced it to a smoldering wreck within 32 seconds. The zeppelin airship loomed larger than three jumbo jets in order to carry a dining room, a lounge room with a grand piano, sleeping quarters and its own post office during transatlantic voyages. The First Fighter Jet: Me 262 Schwalbe: Germany's secret flying weapon, the Messerschmidt Me 262, arrived too late to save Hitler's Third Reich from its downfall. But the world's first operational fighter jet racked up an impressive kill ratio against the much slower Allied bombers and fighters, and influenced later designs of U.S. military jet aircraft. SR-71 Blackbird: Supersonic Spy Aircraft: The U.S. military's demand for a supersonic spy aircraft capable of flying fast and high beyond the reach of fighter jet interceptors or missiles led to the SR-71 Blackbird. The record-holder for fastest manned air-breathing jet aircraft could regularly fly beyond 2,000 mph (Mach 3) and at altitudes that required its crew to wear astronaut-style suits just in case. Saturn V Rocket & Apollo Spacecraft: When American astronauts flew to the moon, they rode into space aboard the largest and most powerful rocket ever built. The Saturn V Rocket stood taller than a 36-story building and thundered into space with the power of five engines creating 7.5 million pounds of thrust at liftoff. Space Shuttle: The First Reusable Spacecraft: The U.S. space shuttle launched like a rocket and returned like a glider as it ferried satellites, science equipment and astronauts into Earth orbit. Five of them served as the workhorses for constructing the International Space Station as well as launching and repairing the Hubble Space Telescope, but not without tragedy striking twice. 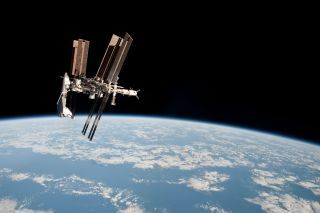 International Space Station: The largest structure put into space by humans required 15 countries and $100 billion to assemble its living quarters, laboratories and solar panels. Astronauts who have lived aboard the International Space Station had stunning views of Earth as they circled the globe every 90 minutes at a speed of about 17,500 miles per hour (28,000 kph). SpaceShipOne: First Private Spacecraft: A $10 million prize inspired the first privately funded reusable spacecraft — the cigar-shaped SpaceShipOne that launched in midair from beneath the belly of its airplane mother ship. Its early success led to SpaceShipTwo, a spacecraft designed to fly two pilots and six passengers on suborbital trips that give everyone a few minutes of weightlessness. V-22 Osprey: Controversial Dream Machine: The V-22 Osprey has fulfilled the longstanding dream of making an aircraft that can hover like a helicopter and fly like an airplane — a feat requiring wing-mounted rotors that can tilt to act as helicopter blades or propellers. But the U.S. military aircraft only emerged after years of development troubles. You can follow InnovationNewsDailySenior Writer Jeremy Hsu on Twitter @ScienceHsu. Follow InnovationNewsDaily on Twitter@News_Innovation, or on Facebook.